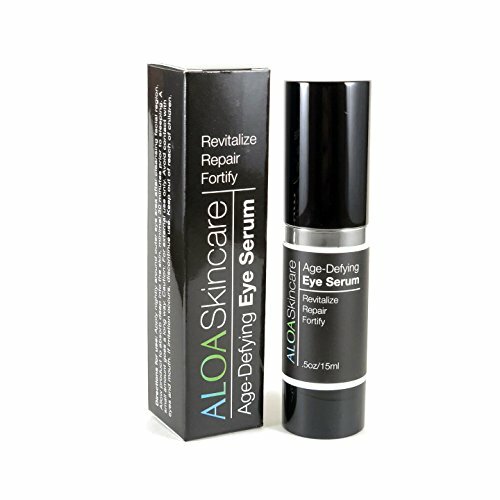 ALOA Skincare Eye Serum is a powerful, organic formula for targeting fine lines, wrinkles and sun-damaged skin. Vitamin enriched formula infused with evening primrose and borage seed for anti-inflammatory treatment for face and skin surrounding eyes. Our formula contains concentrated sources of Gamma Linoleic Acid (GLA), an omega-6 fatty acid with anti-inflammatory properties. GLA also helps retain moisture and allow skin to stay supple and flexible. Studies have proven that GLA can reduce transepidermal water loss (TEWL), which is helpful particularly for mature skin as it begins to dry out with age. Restore your natural moisture balance for a bright and youthful complexion. Why Eye Serum at night? At night, our skin is most active to repair and rebuild. While our body is at rest, ALOA Skincare Eye Serum is specially designed to promote cellular renewal and hydration while fighting free radical damage too. Nighttime Eye Serum to correct sun and age related skin damage, blemishes and even out skin tone. Anti-Aging - Hydrates the skin reducing the appearance of wrinkles, increases elasticity and minimizes the appearance of dark spots. If you have any questions about this product by ALOA Skincare, contact us by completing and submitting the form below. If you are looking for a specif part number, please include it with your message.